We know no words to ease your pain as your loss is immeasurable. Please know that today and forever we will hold all of you close in our hearts. Rest in peace brother...I will keep your family in my prayers. May God Bless you, your family, friends and the members of CHP. Rest in Peace my Brother! To one of the many who have sworn to protect my friends, family, and those who I never met, our thoughts and prayers to your family, friends, and my brothers and sisters at the CHP. Rest easy, Officer Dickey, we've got it from here. Rest in peace fellow brother, we now have the watch. I am so saddened by the loss of another young officer with a young child . It always is so terrible to deal with .My prayers are with the family of Officer Dickey..Being the Mom of a fallen officer ..I do understand the pain ..I hope all of these men and women are on the same cloud watching over us. TO THE WIFE AND CHILD, FAMILY, FRIENDS, AND COWORKERS, MY DEEPEST CONDOLENCES. MAY GOD BLESS EACH ONE OF YOU. MAY YOU FEEL HIS LOVE, HOPE, AND COMFORT, DURING THIS SAD TIME IN YOUR LIVES. TO MY FALLEN BROTHER, MAY GOD BLESS YOU AND MAY YOU REST IN PEACE. A HERO FOR SURE. YOU HAVE SERVED WELL. It pains me greatly to see a picture of another fallen CHP officer. I am saddened by the loss of all of the officers, but the sight of that CHP badge and uniform is etched in my mind and heart now, since my brother was killed last year, and it brings back the pain and shock I felt then. I pray for strength for Officer Dickey's wife as she goes through her grieving and raising her child without her husband. He had to have been a wonderful father and husband, with a bright and gentle smile like that. My brother in blue, you will be missed. My prayers and thoughts are with your family. Keep it safe up there until we join you. Your sacrifice will not be forgotten. You and your family are in our prayers. Rest Easy Brother! OFFICER DICKEY,THANK YOU FOR YOUR SERVICE.MAY THE LORD KEEP YOUR FAMILY IN HIS LOVING ARMS,DURING THIS TIME. Trooper Dickey, I thank you sir for your service and your ultimate sacrifice for California. You are a hero. Thank you again. To the Dickey family, you have my prayers and my deepest sympathies for your loss. May God give you much grace and comfort to get you through this great time of trial. To all CHP officers, you have my prayers and sympathies as you have lost one of your family members as well. Thank you all for doing such a great job. You are definitely very much appreciated. I will pray for you as you continue your patrol. Romans 13:4! Im very sorry for your loss. God bless you and your family. Godspeed my brother. 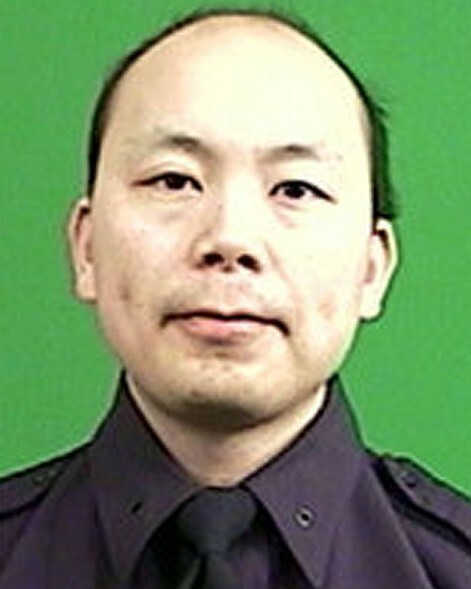 May God grant peace beyond understanding to all that loved this officer. Rest in peace brother. Thank you for your service. My thoughts and prayers are with your family, friends and department. Heroes such as you will never be forgotten. God speed. Thank you, Officer Dickey, for your service to the citizens of California and the United States. Your dedication and efforts are appreciated and will not be forgotten. Rest in peace, Hero. Rest In Peace, Officer Dickey. My thoughts and prayers are with the family and friends of Officer Dickey. May he rest in peace. I am very sorry for the loss of this dedicated hero. The State has lost one of its finest. I am a surviving child of a fallen officer. God bless his department and family. God bless you and your family. You and your family will be in our thoughts and prayers. Blessed are the peacemakers for they shall be called sons of God.